111 - What if french fries and drinks had war? 109 - What if the fur force got a plane and started having fun and crash landed in a worm hole and went to the future? 108 - What if an evil wizard turned all the cats into dragons but fred the dog saved the day? 107 - What if tigers lost their stripes? 059 - What if babysitters sat on babies? 106 - What if puzzles could walk and talk? 105 - What If Pixicato and Sprite Alright went into a dungeon and found a golden trophy but it turned everyone into paper? 103 - What if JFKat had a friend named Purrcy and everytime he purred everyone around him fell asleep? 102 - What if I was a unicorn and I could give stuff from my horn and fred the dog could find my fairy garden? 101 - What if Cthunkle did his show "What Is World" and interviewed Mr. Eric? 100 - What if up was down and down was up? 54 (Rerun) - What if ninjas and pirates starting fighting over which chair they wanted to sit in? Join Our Patreon to Hear Archived Stories! We can only host 100 episodes on our RSS feed, but your unique Patreon feed gives you access to our entire backlog! Patron eps are always ad-free & released early, with higher quality audio. Kids can also get a shout out on the pod from your favorite character, bonus stories, snail mail from Mr. Eric, and a much better chance of having their question turned into a story! Who should be President of What If World? Abacus, Fred, JFKat, Whendiana, Mr. Mouser, or Alabaster? Write your vote as part of your review, or post on Facebook, Twitter, or our private group, The Conversatorium. Make your voice heard and help shape What If World! Join What If World on Patreon! We can only host 100 episodes at a time on our RSS feed, but your unique Patreon feed gives you access to our entire backlog! Patron episodes are always Ad-Free & Released Early, with Higher Quality Audio. You can also get a shout out from your favorite character, bonus stories, snail mail from Mr. Eric, and a much better chance of having your question turned into a story! Mr. Eric has a chance to appear on a panel at SXSW! Please give a quick signup here to vote for us. If they get enough votes, he’ll be teaming up with the amazing shows Wow in the World, Brains On!, and Ear Snacks to spread the message of quality podcasting for children. Thanks a million! This week, What If World teams up with five other amazing kid-friendly podcasts to bring you a Road Trip Mixtape! You’ll hear from Circle Round, Little Stories for Tiny People, Noodle Loaf, Story Spectacular, and Book Club for Kids. Of course, Mr. Eric will answer a What If Question with a fun roadtrip mini episode, too. Hope you enjoy it! You can help us win a Podcast Award! Sign up here to vote for What If World in the Kids & Family and the People's Choice categories. It's our first time being nominated and we need your help! Thanks a million. Please check her show for more great jams and stories, and check out Patreon page if you want bonus content like this more often! Fair Elise and Pixacato are fed up with work and school, respectively. Good thing it’s Freaky Friday! Can Fair Elise survive a day in ballet school? Can Pixacato solve the mystery of the missing robot brains? Did Alabaster Zero also get Freaky Friday’d, or does the grizzled cop just really love ballet? We now have a P.O. Box! Mr. Eric will be happy to share your letters and drawings online (excluding personal information, of course) or use them to inspire his next story! In case some of you missed it last week, Mick Sullivan wrote my new favorite song for our Vampirton episode. If it gets stuck in your head like it did mine, you might want to check out The Past and the Curious, a history podcast for kids! 66 - What if I did an interview with Abacus P Grumbler? Miss Karen and Mr Eric are moving this week, and we’ve made a very special episode to share with you all! Find out more about Abacus P. Grumbler and see if Mr Eric can survive his magic! Mr. Eric managed to come out of his turkey and pie coma just long enough to post one of his favorite episodes, the story of Shark Wars! Fred the Dog and JFKat will make a quick appearance after the story, so stay tuned. What If World will be back with an all new episode next week! Looking for the perfect holiday gift? 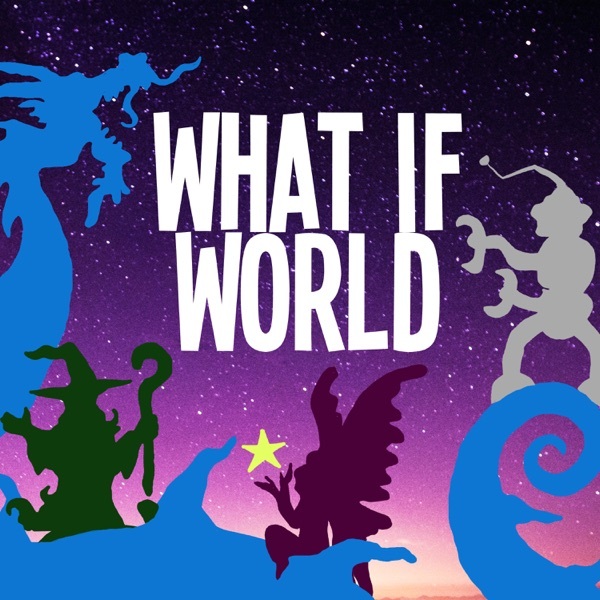 Check out the What If World Threadless shop for t-shirts, totes, blankets and more! 54 - What if ninjas and pirates starting fighting over which chair they wanted to sit in? Pirates and ninjas and robots, oh my! Mr. Eric tackles two questions this week, as Ninja Girlden and Petey the Pirate meet for the first time. They’re both so anxious about making a good impression that they end up arguing over a chair! 52 - What if the sorting hat from Hogwarts started saying random words instead of houses at the start of the year? Be a real What-Iffer and join us on Patreon! Get access to live-stream stories, branded swag, one-on-one FaceTime with Mr. Eric, activity books & more! Petey the Pirate & Whendiana Joan finally get their turn to tell a story this week in the conclusion of our Halloween Special! We're also letting folks know about the Kids Listen App! Have you ever heard the tale of the Guy Who Cried Vampire? Well, neither has hard-nosed detective Alabaster Zero. Can he and Fair Elise get to the bottom of this vampire mystery? And what's the deal with that cat? 43 - What if a chicken could ride a cloud and Abacus P Grumbler turned me into a lion? When Charlie, Carson, and Farmer Cobb lend a hand to the hapless wizard, Abacus P. Grumbler, he promises them each a magical gift in return. But the old sorcerer can rarely get one spell right, let alone three! This week we're taking a break to rerun one of our FAVORITE stories! Will Rola the Rabbit find her family? We love doing the show for you, and we want your feedback! Let us know what you like, what you want more of, and what we can do to make the show better. Reviews help us improve the show, and helps more people discover us! Each member of the Kids Listen community is theming an episode around summer travel this July! Check out more summer travel podcasts at the Kids Listen app to discover your new favorite show! 17 (Bonus) - What if cars could fly? DELETED SCENE! 16 - What if dogs never grew? If you've ever owned a puppy, you've asked yourself this question: what if dogs never grew? When the young Howdy Pooch meets a senior dog at the park and learns about growing up, he decides to dig his way to No No Land and stay a puppy forever! 10 - What if a rabbit laid eggs in a cloud that fell down? This week we relate the old What If World parable of the Rabbit That Laid Eggs In A Cloud That Fell Down. Will Rola the Rabbit find her family? Will Dontknowhen, the Goblin Minstrel, every pipe down and let Mr. Eric tell the story? There's only one way to find out! 9 (bonus!) - What if I turned into a video game? On our very first bonus episode, Captain Keira and her wise-cracking friend, Mr. Mock, get turned into a video game! Can they beat the secret level of Super Spelunkers, or will they keep bickering until the Giant Frog gets them? !